Collapsing Demand where we saw crude falling to $25/bbl on weak global demand that would make it impossible to repay much of the huge debts that had been built up since 2008. This is the result of economic stimulus polices that we maintain have largely been a waste of money. We also raised a Comfortable Middle scenario of $50/bbl. This would be where stimulus policies would, in fact, have been worthwhile as the global economy recovered. This is where have been over the past 12 months, according to consensus opinion. Continuing Tension involved crude returning to the region of $100/bbl on geopolitics leading to supply disruptions. This would stall economic recovery. Continuing Tension is a growing risk for 2018 as a result of the North Korea nuclear crisis. There also multiple potentially negative outcomes in the Middle East, including a war between Israel and Hezbollah, connected with which could be growing tensions between Iran and Saudi Arabia. And today, of course, crude is already testing the upper limits of our Comfortable Middle scenario. As of this morning, WTI was at $58.15/bbl, 28% higher than its low point so far this year, which was in June. Brent was $63.51/bbl – 37% higher than its June 2017 low. Prices began to pick up in July. But until November, their recovery was due merely to stronger seasonal demand and hedge funds taking out further long positions. In other words, the rally could have quickly gone into reverse. Since November, though, geopolitics have created the potential for a “breakout” in pricing to above $70/bbl. This follows the launch of Saudi Arabia’s anti-corruption campaign. The OPEC and Russian decision to extend output cuts to the end of 2018 is obviously another factor behind the rally in pricing over the last few days. But I do not believe that OPEC and Russia have achieved, or indeed can ever achieve, a genuine tightening of the market. The reasons are rising US shale oil output and the rapid approach of Peak Oil Demand. You must, though, build geopolitics into one of your scenarios for crude pieces year. Prices have a significant chance of defying these long-term fundamentals over the next year. Unless geopolitical tensions ease, crude might well stay closer to where it is today and could so easily go significantly higher. 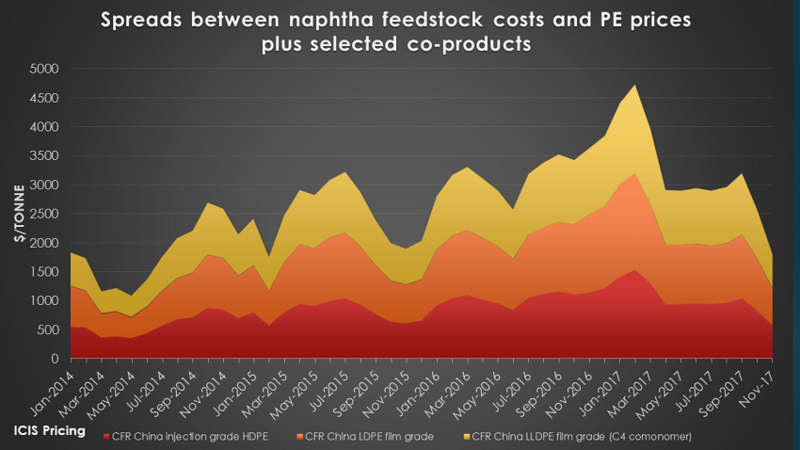 What the above chart shows is the spreads between naphtha feedstock costs and the prices of three major grades of polyethylene (PE) between January 2014 and November 2017. You will also see I have added selected co-product credits to the spreads between feedstock costs and PE prices. How this chart works in detail is explained in the notes at the bottom of this post in italics*. The average spread between naphtha and these three grades of PE plus co-products was $599/tonne. This was down from an average across these same three grades of $1,115/tonne in January-October 2017. November also marked the lowest spread since July 2014, when the spread was at $586/tonne. But in July 2014, Brent crude was at $107/bbl compared with November’s $62/bbl. This suggests that spreads are today more vulnerable to higher crude than in June 2014. 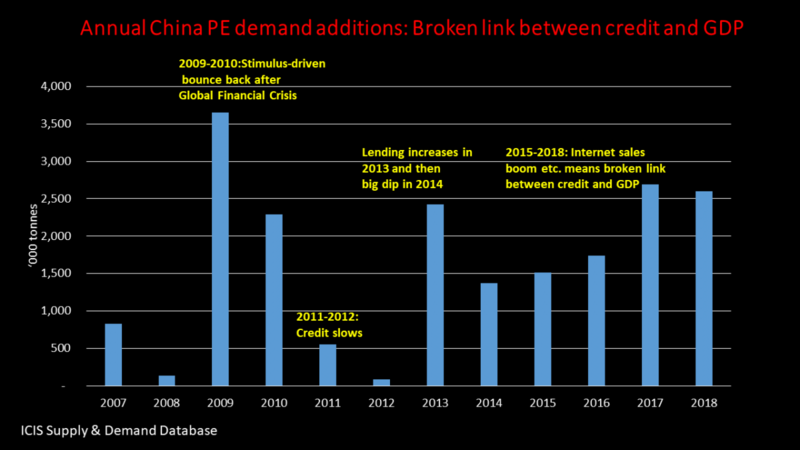 This will occur as Chinese economic growth weakens on slower lending growth. Reducing credit availability is a key element of China’s economic reforms, along with the environmental campaign. 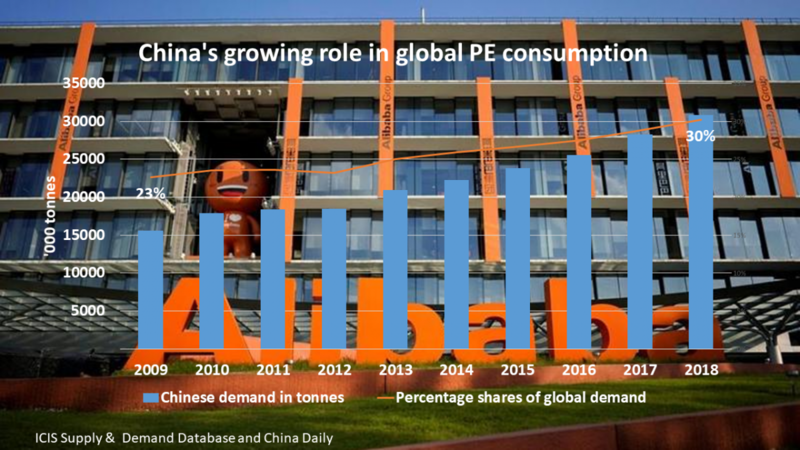 Vast new PE supply is also set to arrive in Asian PE markets next year as a result of all the new US start-ups. The impact will be most-pronounced in C4, C6 and C8 linear-low density (LLDPE) film grades because this is where the supply editions are the greatest. 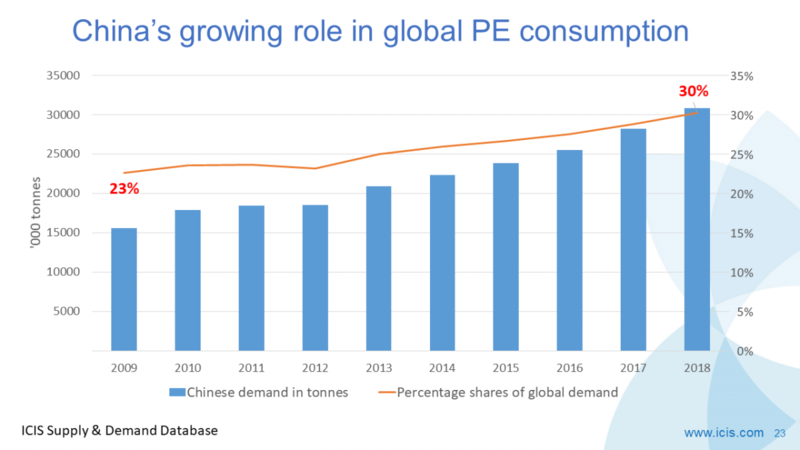 Between 2018 and 2025, our ICIS Supply & Demand Database forecasts that total US LLDPE production will rise by 67% with local consumption up by just 12%. This implies a 321% jump in exports. China will have to absorb most of this surplus because of its import demand so much bigger than other country or region in the world. But if China’s economy slows, then import demand could disappoint. 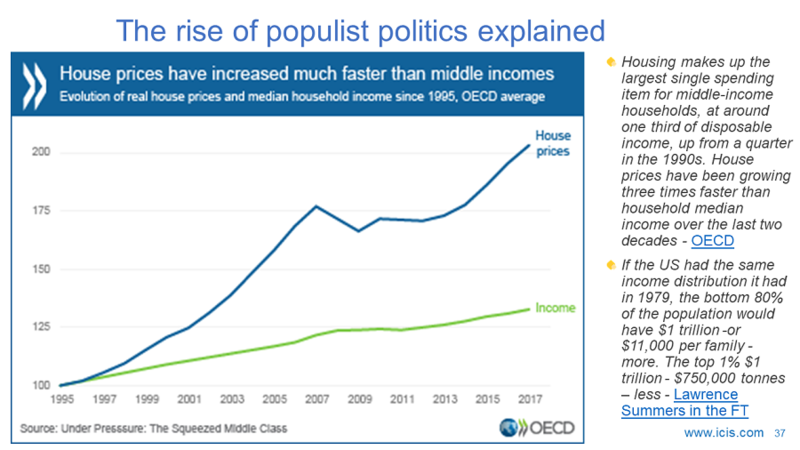 And given what I maintain are fragile recoveries in the West because of the underlying dynamic of ageing populations, there is a risk that growth in the US and Europe will be damaged by stronger inflation. Sure, there are seasonal factors behind the collapse in spreads in November to their lowest level since in more than three years. 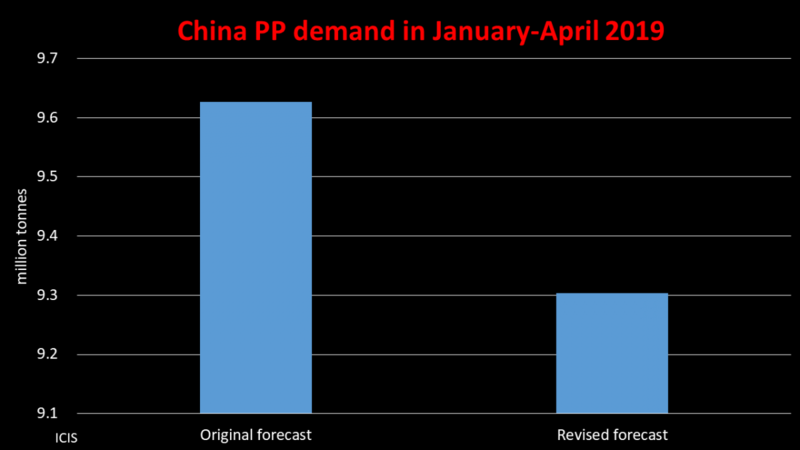 This time of year always sees weaker demand in the key China market. 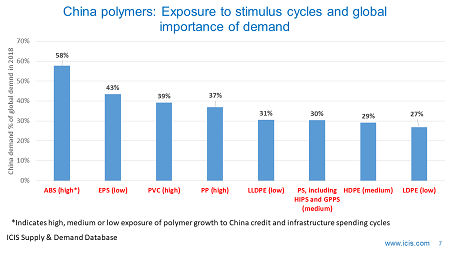 I would, however, still have expected a better pass-through of increased naphtha costs if it hadn’t been for what has already been a marked slowdown in credit growth in China. Economic reformers are already putting their foot firmly down on the accelerator pedal now that they have strengthened their position following October’s 19th National Party Congress meeting. Further evidence to this effect was the November Caixin China General Manufacturing Purchasing Managers’ Index (PMI) which fell to a five-month low because of slowing new orders. Optimism about business prospects over the next 12 months declined for the third consecutive month, with the future-output sub-index falling to the lowest level since the indicator was first included in the PMI report in April 2012. Asian PE spreads, and therefore margins, might thus surprise on the downside in 2018. The consensus opinion is that despite all the new US supply, margins will remain very healthy. But this is based on the global economy remaining as it is today. You clearly need to plan for something very different. 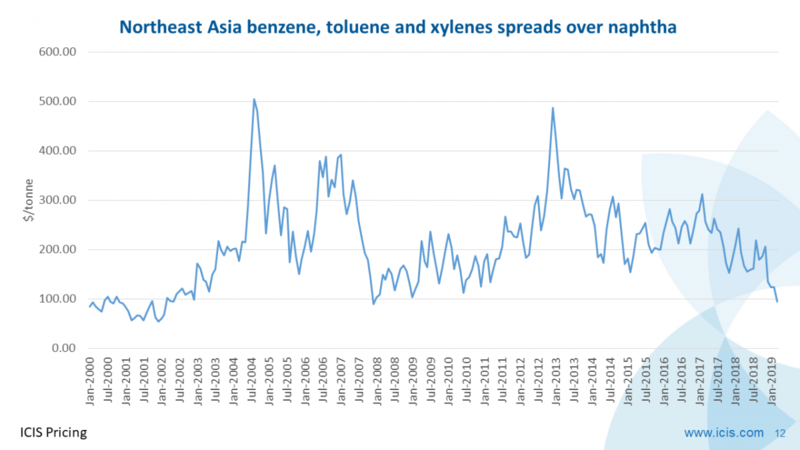 *Methodology behind the chart: It takes around 3.3 tonnes of naphtha to make a tonne of ethylene. And about one tonne of ethylene makes a tonne of PE. When you feed 3.3 tonnes of naphtha through a steam cracker to make that tonne of ethylene, you also get approximately 0.52 tonnes of propylene, 0.33 tonnes of crude C4s and 0.75 tonnes of aromatics – i.e. benzene, toluene and xylenes. 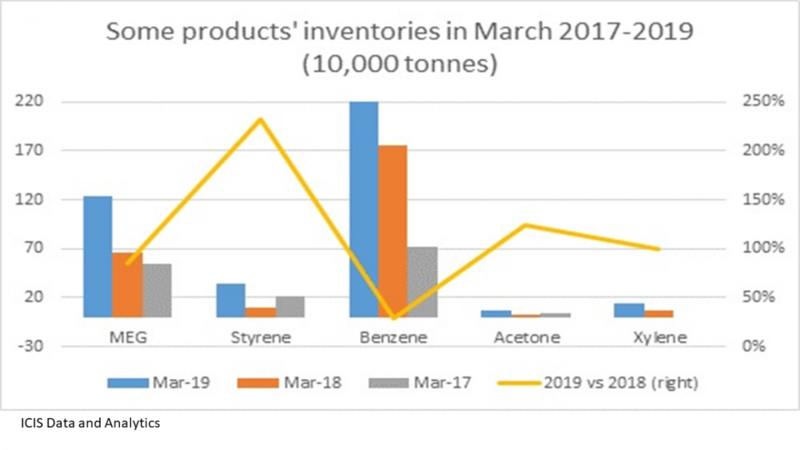 I have thus added to the naphtha-PE spreads the spreads between naphtha and the prevailing ICIS Pricing prices for these other products – times of course these multiples. Spreads are of course not margin, as they do not include production costs. Also missing here is any extra money that naphtha cracker operators may have made from selling merchant ethylene – and money from other co-products, such as hydrogen and fuel oil. Nevertheless, this chart clearly shows today’s challenge of higher crude prices – and shows the value of ICIS Pricing data.